The Bohol Human Resource Management and Development Plan (HRMDP) is an integrated five-year (2011-2015) plan for the management and development of the human resources of the Provincial Government of Bohol (PGBh). The HRMDP is a recognition of the critical importance of enhancing the capability of its workforce to fully carry out plans and targets towards achieving its goals and objectives, knowing fully well that the most important asset of any organization is its human resources. The PGBh is aware of the multitudes of challenges it is currently faced with to ensure that strategic development directions and programs are implemented in a manner that meets the needs of its constituents. Capable, well-resourced and equipped personnel and robust human resource systems are required to meet these tasks. The Plan addresses issues and challenges along five areas of human resource management and development: organization, personnel, HR systems, health and wellness, and capacity development, across the four phases of HR management — recruitment, retention, rewards and recognition, and retirement. It is an update and an enhancement on the previous three-year HRMD Plan crafted with the assistance of the Philippines-Australia Human Resource Development Facility (PAHRDF) also of the AusAID. To address calls from both external and internal drivers for transparency and accountability of governance, the Provincial Government of Bohol established in late 2010 the Provincial M&E Systems (ProMES), through Executive Order No. 25 issued by Gov. Edgardo M. Chatto. Among the plans to be monitored for the next five years (2011-2015), is the HRMDP to check the results and outcomes of all HR interventions. In March 2011 following the creation of the ProMES, Gov. Chatto also issued EO No. 10 establishing the M&E System of the HRMDP. The System is designed to check whether HR services and initiatives are delivered in a timely and efficient manner and if the recipients of the interventions are making impacts on the lives of the Boholano people by increased productivity and performance of functions. The System helps extract from past and on-going activities relevant information that can subsequently be used as the basis for programmatic fine-tuning, reorientation and planning for continuous improvement. This M&E System must be operationalized and continually strengthened to enable the PGBh to respond to demands for (a) greater accountability in the use of resources, (b) a clearer basis for decision-making, and (c) more practical lessons from experience to guide future development interventions. 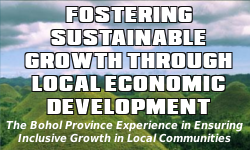 This system aims to monitor and evaluate capacities of the provincial governance to achieve the desired outcomes and impacts, thereby attaining its goals of efficient and effective delivery of public service for the Boholano people. 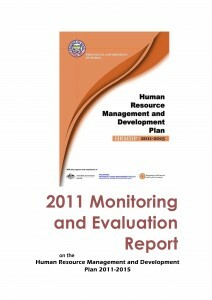 The HRMDP M&E System is based on guiding principles adopted from the integrated M&E framework of the Provincial Government of Agusan del Sur, which are the following: (1) flexible, (2) evidence-based and results-oriented, (3) consultative and participatory, (4) gender-sensitive and responsive, (5) culture-responsive and respective of religious diversity, and (6) constructive and progressive. The HRMD M&E System will make use of existing government systems such as the Local Governance Performance Management System (LGPMS) and the System on Competency Assessment for Local Governments (SCALOG). It recognizes the presence of competencies in PGBh which can be tapped to produce a system that is accessible, flexible, efficient, effective and sustainable. What does the System intend to achieve? What are the enabling environments required by the System? Who will be engaged by the System and what are the engagement processes? How does the System innovate itself in a continuous, iterative manner? To download the document, click on the link below or on the image to the right.